WHAT IS A SPINAL CORD TUMOUR? A spinal cord tumour is an anomalous and unnecessary growth of abnormal cells in the spinal cord or its coverings. The mechanisms that control cell growth of a tumour cell are damaged, so the cell loses control over its reproductive cycles and reproduces rapidly, again and again, eventually growing into a tumour. When the tumoural cells originate from the actual components of the spinal column, a primary tumour, which can be either benign or malignant, arises, whereas when they originate from tumoural cells located in other parts of the body, they result in secondary (metastatic) tumours, which are always malignant. Tumours vary widely in terms of their location, type of tissue involved, and degree of malignancy. Usually, benign tumours, such as neuromas and meningiomas, have slow growth, are well defined with respect to surrounding tissues, and are curable if they can be completely removed by surgical means. Malignant tumours, such as gliomas, however, have rapid and aggressive growth, invade surrounding tissues (so are not well defined), and are not surgically curable since the tumour rapidly reproduces again after the operation. In addition, depending on the location of the spinal cord tumour we distinguish between tumours of the coverings, tumours of the nervous tissue and tumours of neighbouring supporting structures (spine), which are usually metastatic tumours originated from tumoural cells located elsewhere in the body. Growing tumorous tissue compresses, pushes, invades and induces oedema of the surrounding nervous structures, thus causing them to malfunction. The initial symptoms will involve neurological defects: loss of strength in a body part, loss of sensitivity, lack of bowel or bladder control, feeling of electric shocks on a body part, etc. As the tumour grows, the symptoms will get worse to the point of causing complete paralysis or one or more limbs (paraplegia or even tetraplegia, depending on the area where the tumour sits). HOW ARE SPINAL CORD TUMOURS DIAGNOSED? Diagnosis is made based on the symptoms and neurological examination and then confirmed by MRI, which can show the size and exact location of the tumour, as well as suggest the nature of the tumour (but not determine this nature with absolute certainty). The objective of surgery is to remove as much of the tumour as is possible without injuring the surrounding nervous tissue. Even if the tumour cannot be totally removed, the removal of part of it will reduce symptoms and improve response to radiotherapy and chemotherapy. In many benign tumours, surgery can be a cure. In malignant tumours, however, surgery is NOT a cure; its objective is to diagnose with certainty the type of tumour, to reduce its size to alleviate the symptoms arising from brain compression, and to prepare for other treatments, mainly radiotherapy and its variations and chemotherapy, that are more effective if the amount of tumour that remains has been reduced to a minimum. Usually, malignant tumours will infiltrate normal spinal cord and so this portion of the tumour will have to be left and not removed, for removing it would induce severe sequelae such as paralysis or lack of sensitivity in one or more limbs and lack of bladder or bowel control. An adjuvant surgical option is photodynamic therapy (PDT), which enables the removal of tumorous tissue without damaging normal nervous tissue. Conventional radiotherapy involves the administration of ionising radiation to the tumour and surrounding tissues, sometimes including all of the spinal cord and in some cases even the brain. Its objective is to stop the growth of tumour cells; and though it cures only a few tumours, in the rest it contributes significantly towards controlling the tumour, thus reinforcing surgery and chemotherapy. Chemotherapy stops the growth of many brain tumours. Nowadays there is a great number of chemotherapeutic agents, and the oncologist will decide which of them will be better for the patient at each stage of the disease depending on the type of tumour and on its size. It is usually used together with radiotherapy and surgery. WHAT WILL HAPPEN DURING A SURGICAL PROCEDURE? 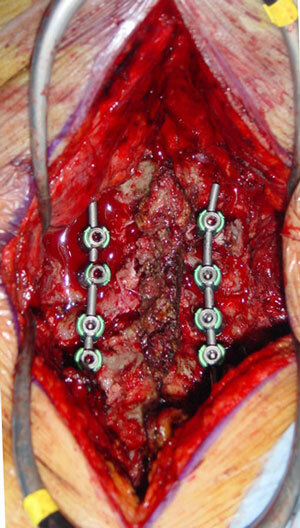 Surgery will involve opening the vertebrae to access the tumour and remove it. Sometimes, a small sample of the tumour is analysed intra-operatively to have a provisionally ascertain its benign or malignant nature, but the ultimate report will be released after 4-6 days after the procedure. Once the tumour has been removed, inserting a scaffold of screws and bars (arthrodesis) may be necessary to maintain the stability of the spinal column. This scaffold will allow earlier recovery and prevent additional lesions to the spinal cord and its nerve roots. The difficulty and duration of the procedure will depend on the type and location of the tumour, but they are all long, laborious procedures because a lot of care and patience is required to remove the tumour completely, if possible, without damaging normal nervous tissue. Postoperative recovery will depend largely on the condition of the patient before the procedure and on the exact location and size of the tumour. In the majority of cases, after surgery, the patient will be taken to the neurosurgery ward, but if the tumour was located at a high thoracic area or at the cervical area, the patient will be taken to the Intensive Care Unit (ICU) to make sure that when the post-surgical oedema of the spinal cord appears no breathing problems arise. After 4-6 days, the results of the anatomical pathology of the tumour will be revealed, and a therapeutic strategy will be chosen depending on these results. The patient will be discharged 3-10 days after the procedure, though may recommended other complementary treatments such as rehabilitation, often advised to recover from the existing neurological deficits. There are a number of complications related to the need for general anaesthesia. Hematoma at the site of tumour removal, though rare, may require a re-intervention, urgent in the majority of cases. Symptoms may worsen, or new neurological deficits may appear. As with any surgical procedure, infections can occur. They can be either mild, if they involve the wound of the skin, or severe and deep, such as meningitis or abscess at the surgical wound.